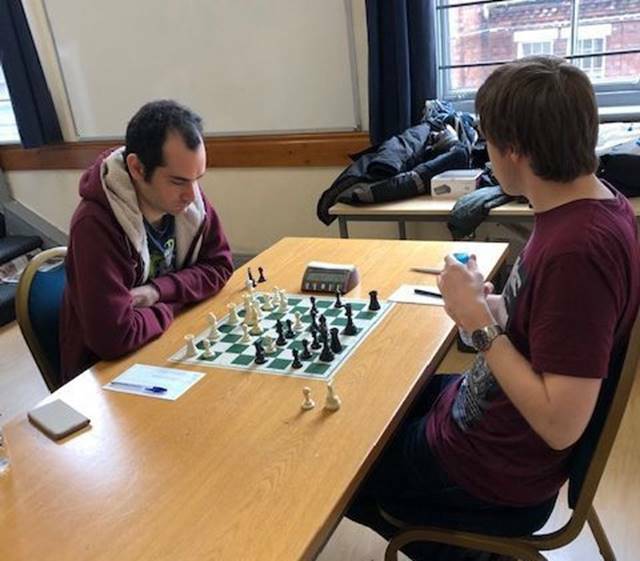 At the York A versus Leeds Woodhouse Cup match played at York on 06/04/2019 there was a “GM clash” on board 1, if you include “GM elect” as being in scope, specifically GM Daniel Alsina Leal (Leeds) versus GM elect James Adair (York) pictured below. Leeds captain Rupert Jones has posed the question of when the last time was that two GMs (albeit one “elect”), both living in the city they played for, had played against each other in the Woodhouse Cup, suggesting the answer, though they didn’t have GM titles as such then, was H. E. Atkins versus F. D. Yates. Atkins was British Champion in 1905, 1906, 1907, 1908, 1909, 1910, 1911, 1924, and 1925. Yates was British Champion in 1913, 1914, 1921, 1926, 1928 and 1931, before dying tragically in 1932. The two certainly met (on board 1) in the Huddersfield v Leeds match of 04/11/1911 (when they drew), and probably on various occasions both before and after.